The Top Six Easiest Ways to Get Real Cash Back into Your Pocket! If you are anything like me, you are all about spending less money when you can. I often say that I am an excellent shopper. I am all about deals, sales, and getting the most bang for my buck. That’s why one of my favorite things is cash back apps and websites that help put money right back it to your pocket. There are a lot of sites out there that claim to give you cash for stuff, like survey sites, but they can take forever to get a payout and quite often I will give up before that payout even happens. What I love about the websites and apps here in that post is that I know I will be getting some money either that day or within a month or so. There is also no waiting to be “accepted” to use these apps like some cash back apps. So without further ado, here are my top six favorite websites and apps to get money back in to your pocket! This is by far my favorite cash back grocery shopping app. There are tons of incentives and deals that will give you cash back! Most of the deals on this app can also be coupled with coupons or weekly deals at your grocery store. There have been plenty of times I have ended up basically getting an item for free. All you have to do is “unlock the offer”, usually by watching a video or answering a poll, scan the barcode of your item, and snap a picture of your receipt. Ibotta will pay you through PayPal whenever you reach a $20 balance. Just be smart about your shopping – don’t by something just to get the deal. Make sure whatever you are buying is something you will actually consume! These are two other great cash back grocery shopping apps. Checkout 51 is probably the hardest to get a payout on. You need to have a balance of $20 and it can take a while to build up unless you buy a lot of goods with the offers. MobiSave pays out right after you upload your receipt – even if you only earn ten cents! MobiSave has a lot of brand specific deals as well as a lot of any brand deals, like ten cents back from buying a bag of pretzels or mustard. Both apps will pay you directly to your PayPal account. Bing is a search engine that will pay you to do daily searches. I never considered using Bing until the school I worked at decided to block Google (honestly, I still don’t know why!). Bing was the search engine that started popping up on my homepage and I noticed as I was doing typically daily work that a number was slowly growing up on the toolbar. I investigated and found out that Bing will give you gift cards (Starbucks, Amazon, etc.) when you reach a certain number of points. To me, this is awesome. I basically can get a free $5 gift card to Starbucks in less than a month. You can earn points by searching on your mobile device, your desktop, and they have bonus points you can earn through quizzes, emails, etc. Google is still blocked a year later at work, but I also now have $70 extra dollars on my Starbucks card. Thanks, IT! I have no idea why it took me so long to realize this was a thing. I saw commercials, read about it, but never decided to use it. Once I opened an account I instantly wished I had created one earlier. I thought about all of the online shopping I had done in the past year and how much cash back I had missed out on. Sadness! 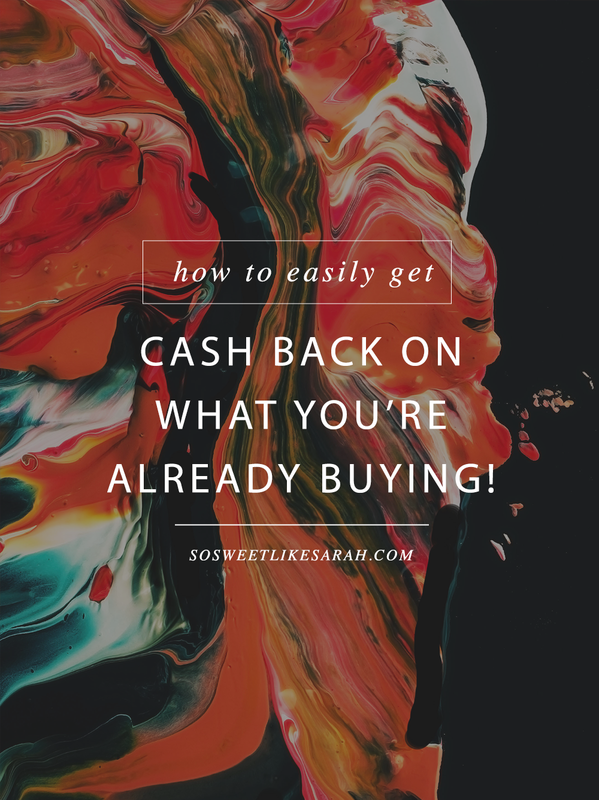 Ebates will give you cash back (from 1-10%) on your online purchases and literally every site you can imagine, even places like Etsy! You can activate the cashback offers by starting out on the Ebates website or downloading the toolbar. The toolbar is super helpful because it alerts you when you are on a site where an offer is active. They payout 4 times a year as long as you have a $5.01 balance in your account. If you are a frequent Target shopper and you have yet to download this app, get on it now. Cartwheel offers additional discounts on hundreds of items just for using the app and scanning your code when you checkout. There are often some really good deals in there too, like 25% off clothes or shoes! The best part of this app is that you can scan the barcode of products as you are shopping in the store to find out if there is a deal. I scan every single item I pick up while shopping in store. While you do not get any cash back from this app, it still feels awesome to save some extra money on a shopping trip. So there you have it. My top six favorite apps and websites to use with money incentives. By using all of these apps and websites, I am making money on top of spending I would be doing regardless. It’s easy to get started on all of them and even though you may find them to be slow moving, $20 extra bucks is $20 extra bucks. It all adds up in the end!